The newspaper has had a great response this year. Thank you for your hard work. 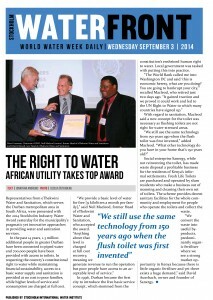 The PFD team has produced conference newspapers for four years for the Stockholm International Water Institute and for three years for Reed Travel Exhibitions having launched the daily for UN-Habitat’s World Urban Forum in 2010. The team produces daily summaries of conference sessions including interviews with panellists and speakers and feedback spots from delegates. In addition, the editorial team can produce copy pre-event for use in the daily newspaper or to promote particular sessions the day ahead through an organiser’s marketing channels. 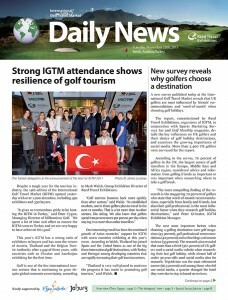 The newspaper is designed and edited by the PFD team then sent for overnight production for distribution to all delegates the next morning of the conference. This can also be organised for hotel distribution. An e-version of the newspaper can also be sent to all tablets and smartphones of delegates and stories can be distributed as they happen on social media during the event.